Our Pumpkin Ale blends the spices of the harvest with full-bodied sweetness for a beer that tastes like pumpkin pie. Pounds of pumpkin form a malty foundation that supports the fall flavors of cinnamon, nutmeg and clove. Big thanks to TheGordianKnot for throwing this one in as an extra. Can't find the freshness info. Enjoyed on 09/19/11. A - The color is great on this one, a beautiful deep, dark red color, almost crystal clear. Only a small head forms and leaves no lacing at all. S - Very spicy. Like an extra cinnamon-y pumpkin pie. Lots and lots of cinnamon and some nice fresh pumpkin aromas. Dark fruity, nutty malts back it up. T - Very nicely balanced. Not as over the top spicy as the nose. Nice rich malts, pumpkin, cinnamon, brown sugar. Finishes nice and malty with a hint of nutmeg and clove. Nice. M - Mouthfeel is excellent. Creamy with pretty low carbonation. O - Overall, I really enjoyed this one, definitely one of the better pumpkin ales out there. Very excited to try this; I've heard nothing but great things. BOTTLE: Bottled 07/31/13. Good label design. Branded pry-off pressure cap. Brown glass. 12 fl oz. I think this is courtesy of Duff27? Thanks to whomever sent it. Served cold into a nonical pint glass at high altitude in Castle Rock, CO. Reviewed live as a pumpkin ale. HEAD: Around 1 finger wide. Khaki colour with pale brown hues. Fairly creamy. Retention is above average - around 3 minutes. Leaves no lacing as it recedes. BODY: Deep copper auburn of average vibrance. No yeast particulate or hop sediment is visible. Appealing for a pumpkin ale, but not exemplary. I've seen better. Appears aptly carbonated. AROMA: Rich pumpkin gourd, copper malts, and a subtle spice profile redolent of nutmeg, clove, allspice, and to a lesser extent cinnamon and brown sugar. The expressiveness of the pumpkin is fantastic. I find no hop profile, yeast character, or alcohol. Aromatic intensity is average. Suggests a pumpkin ale with impressive nuance and subtlety. I'm craving the first sip. TASTE: Has an evocative pumpkin gourd at its core - which is the obvious feature that is so often absent from beers in this style. 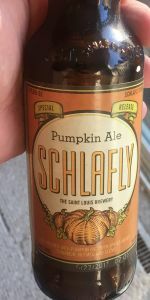 Huge props to Schalfy for accomplishing the simple feat of evoking pumpkin in a pumpkin ale. The subtle spice profile plays off the pumpkin beautifully, with notes of cinnamon, allspice, nutmeg, and clove setting off the gourd and pumpkin skin. It's gorgeously balanced, with a nice interplay of spice, sugars (some seemingly brown), and caramel. Neither too sweet nor too bitter. Well-built. Nicely executed. No overt hop profile, yeast, alcohol, or of-notes. Boasts ample nuance and intricacy. The subtlety of the spices and the brown sugars is marvelous. I quite like this. TEXTURE: Smooth, wet, aptly medium-bodied, very well-carbonated, and unrefreshing. Apt thickness, heft, and weight on the palate. Complements the taste nicely, but there's no harmony of texture to taste. Overall presence on the palate is superb. OVERALL: Highly drinkable. Easily one of the better pumpkin ales I've had in recent memory. This is an excellent go-to pumpkin ale on par with some of the best currently brewed in the country, yet still I can envision one which is better. In any case, it's gestalt - and that's impressive. Well-worth trying, or even seeking out. Excellent work from Schlafly. Hat-tip to the cats brewing over there. Thank you Schalfly for making a worth-while Pumpkin Ale. Rarely does the world get to sample a hearty pumpkin flavor, a very well-made base beer, and spices that contribute to the beer without overpowering. This beer does all this-- doesn't seem too difficult. This beer seems to have a very firm Amber malt toastiness, sweetness, cleanliness, and crispness. The low (but detectable) hop rates make way for the pumpkin and spice variety to shine. The pumpkin delivers a creamy, earthy flavor very similar to fresh-baked pumpkin pie. Mild notes of cinnamon, nutmeg, and all-spice decorate the beer without bringing undue attention to the frills. A mild buttery flavor also brings the beer into desert-range. This is all evedent in the aromas and flavors. The body remains firm, creamy, and relatively round; allowing the flavors to settle into a mellow finish of creamy-sweet pumpkin and caramel. This is likely the best Pumpkin Ale that I have had. Appearance: Deep ruby red with a finger of off white head. Aroma: Big pumpkin pie spice that overtakes everything else. Very little, if any vegetal pumpkin flavor. Taste: While I don’t doubt that this beer is made with pumpkin, I just can’t taste any. The spices completely overwhelm everything just as they did on the nose. It’s malty as is to be expected and it isn’t overly sweet, but honestly there isn’t much more to say here. Biased comments: Wow, what was once my favorite pumpkin beer has, this year anyway, been reduced to a total spice bomb. The only thing I can think is that the beer was brewed in July to be consumed well into the fall, after the spices have faded some. As it stands, its drinkable, but certainly not what I would call enjoyable. Aroma - Holy MOLY! Pumpkin Pie for miles. Fragrant, sweet and spicy. A real treat. Taste - Caramel soaked pumpkin pie with all the spices. Malt lingers in the back, hops soley balance the sweet flavors. Absolutely perfect. Feel - Smooth but not heavy. Actually refreshing. Overall - Probably the best beer of all time. A tight, creamy, two-plus finger tall, light tan crown topped the dark orangey-amber liquid. The head dissolved rather quickly and left no lacing whatsoever. The aroma was pretty mellow initially. Somewhat dry and yeasty. There was a slight steeliness as well. Touch of spice. As the beer warmed, the nose improved dramatically. Pumpkin pie spices were quite apparent. Good amount of cinnamon, nutmeg and clove. Some malty sweetness appeared as well. Unlike the nose, the flavor profile had a lot going on from the get-go. Pumpkin pie spice notes dominated. Cinnamon, nutmeg and allspice were most apparent. There was just enough caramel malt sweetness to give the beer a true pumpkin pie flavor but not overwhelm it. Quite rich and full in flavor for the style. The finish contained a hefty dose of cinnamon that lent the beer a mildly "hot" spiciness. Really solid. Rich and fuller bodied for the style. The liquid contained an ultra fine and frothy, tongue blanketing effervescence. At 8% ABV, the alcohol was barely perceivable. With its punchy yet balanced flavor profile and fuller bodied mouthfeel, Schlafly's Pumpkin Ale is one of the better examples of the style I have yet to dry. I really hope this brewery distributes to New England sometime soon. A: The beer is slightly hazy amber and orange in color and has no visible carbonation. It poured with a thin beige head that completely faded away, leaving only a thin ring of bubbles on the surface around the edge of the glass. S: There are moderately strong aromas of pumpkins and spices such as nutmeg in the nose. T: The taste is very similar to the smell, except that the pumpkins really stand out in front of the spices. O: This beer is very easy to drink and has no traces whatsoever of alcohol. The taste has a very good balance between pumpkins and spices but much more pumpkin flavors compared to other beers in the style. I was able to pick up a twelve pack of this one. I had heard very good things and this was as solid as a pupkin ale as I was gonna get this year. Served cold, this will be my official review after drinking this one for a couple months. Consumed on 01/07/2009. The aroma was light, nicely spiced and full of grain. lIght notes of fresh hops bouncing around in here with lots of nutmeg and cinnamon. The flavor was very solid. Light grains, nutmeg, cinnamon, pumkin, and touches of light grass flavors. Really very well done. No hint of alcohol at all. I actually just saw this was 8%, what the hell, I thought it was like four. This was really well done and very sessionable. I had no idea how strong this was. Overall one of the best, most drinkable pumkin ales I have come across. Not really anything bad to say here. Solid all the way around! Look: Pours a deep, dirty amber color; I like the fullness of the body as you can tell it's going to pack quite the pumpkin punch. Small, tan head that dissipates rather quickly and leaves minimal lacing. Aroma: For me, everything I would want in the ideal pumpkin beer; leads with cinnamon, faint nutmeg, and huge, fresh pumpkin pie (crust included). It's more pumpkin pie and less pumpkin spice, which is what does it for me. Everything about the beer is rich and delicious. Taste: Full of sweet pumpkin pie and spice (primarily cinnamon), nice malt backdrop and the alcohol is masked perfectly. Feel: This beer goes down smooth, medium/light carbonation, and leaves a sweet, malty, pumpkin pie coating. Can't believe it's 8%! Awesome, can't wait to get more of this! Easily the best pumpkin beer I've enjoyed and it lived up to all the expectations I had for it. The only thing this needs is a dollop of whipped cream on top! This is hands down the best pumpkin ale I have ever had. I think they took beer and pumpkin pie fillin to a vitamix, put it in a bottle and said "You're welcome!" ... thank you Schlafly! Not generally a fan of the pumpkin beer fad, but this one is something special. Pours a deep orange-brown. Heavy on the spice notes. I get cinnamon, nutmeg, gingerbread, pie crust, and just a hint of the pumpkin. Like pumpkin pie, but very balanced and drinkable. The 8% ABV is basically nonexistent. Some people prefer Southern Tier Pumking, but I think that beer is way too over-the-top and syrupy. This is up there with Cigar City Good Gourd as the best pumpkin beer. Top five pumpkin ales, and possibly #1 in drinkability. The balance is just perfect. The spices don't overwhelm the pumpkin, there's a fair amount of alcohol and even a bit of sourness to round out all the flavors. The smell is nice, the flavor is great, just an excellent all around beer. For not my favorite style, this version is really a standout. Bottle: Poured a deep dark cloudy amber color ale with a medium size foamy head with OK retention. Aroma of nutmeg, pumpkin and cinnamon with sweet malt backbone is quite enjoyable. Taste is a nice mix between some nutmeg, cinnamon and pumpkin with lightly sweet malt backbone. All flavours are very well balanced with sweetness offsetting some of the spices so that nothing gets out of hand. Body is quite full with good carbonation and no apparent alcohol. Very well brewed with great level of complexity while retaining good marks for drinkability. Glowing, jack-o-lantern orange with butternut edges. Pumpkin Ale is the perfect color for a pumpkin ale and is darker and richer than most. The three finger cap is palest ecru with a subtle infusion of palest orange. Too bad there's nothing remarkable about it. That, and the fact that there's very little lace, pulls the appearance score down a half notch. I could smell the spices as soon as the cap was removed. The nose is nicely pumpkin pie-like and complements the base beer--a big amber ale--very well. While cinnamon and nutmeg are easily identified, the mystery spice is still a mystery (see more below). I've smelled better pumpkin ales, but not very damn many. Given the ABV and the 'Special Release' designation, I was expecting something a little more bold. I'm not complaining though; this is still good beer and is one of the better versions that I can remember drinking. One of the most amazing things is that alcohol is next to absent on the palate. I love the understated, almost honeyish, sweetness. Whether it's due to pale malt, caramel malt, pumpkin or butternut squash, I couldn't say. There isn't a huge amount of squash flavor, but there is a pretty big spice load. The website lists the spices as cinnamon, nutmeg and clove. The label lists them as cinnamon, nutmeg and ginger. My guess: ginger. The mouthfeel is deserving of big beer status. It's firmer than it is soft, with a pleasing heavy silkiness and a supreme smoothness. A restrained amount of carbonation is the perfect match and keeps pumpkin spicy burps to minimum. Not that I mind pumpkin spicy burps. I know that early February isn't the most opportune time to be drinking a pumpkin ale, but I figured that an 8.0%'er would hold up well being holed up for a few months. And it has. Schlafly Pumpkin Ale is one of the best damn gourd beers that I've ever had. Thanks jpm30. This beer is unreal. When I moved to St. Louis, everyone told me to try Schlafly. The beers are ok, but this one blows all of their top dog beers out of the water. Every fall that I've been here I buy a case of this beer. I usually lean more towards IPAs, but I always drift away during fall and Christmas Bc of beers like this. Color is a nice foggy Amber color. Smell is cloves and cinnamon, not much pumpkin. Taste booms with pumpkin, cloves, all spice, cinnamon, and pie crust. The pie crust taste is what really Seperates this beer from others. Still amazes me this beer is at 8%. Does not have any sign of booziness in taste or smell. If you can get your hands on this, go for it. Christmas ale by schlafly is similar caliber. edit 2008/09: I pick up this beer every Fall, and manage to blow through a case. It's a very balanced and authentic pumpkin ale without the artificial ingredients & extra sugar. A solid inch of foam on a rusty orange body. It has a thick ring of lace, but i'm more impressed that it has head retention, compared to alot of Pumpkin Ales i've had this season. Pumpkin and cinnamon in the aroma. Flavors of nutmeg, clove, blended in with authentic pumpkin as well. Not overly sweet or spicy. Fuller mouthfeel, somewhat dry finish due to the spice, would be nice if it were a little less dry and tacky. Easy to finish a bottle, I had several in a row when it was fresh in the bottle (2 weeks old). I'm guessing the shelf life isn't the longest, but at 8% it should last a few months, no problem. Poured a clear orange/ copper with a small off-white head with very little retention. Aroma dominated by the pumpkin with a hint of cinnamon spice. The taste was , yes very dominated by the pumpkin with cinnamon and a hint of clove. Very sweet, just like drinking a piece of pumpkin pie without the whipped cream. Mouthfeel was very smooth and creamy, a light towards medium body. The alcohol was well hidden, which was surprising at 8% ABV. This was a nice festive beer for the fall, just a little too sweet for my taste. Pours tan/ light orange into glass with a medium head. Instant smell of pumpkin pie and malt as you pour. The taste of the beer is strong with pumpkin, crust, malt with a medium thickness to it. Compared to other pumpkin beers I've bought this really is a step above them. Would love to buy this again. The perfect beer for fall.